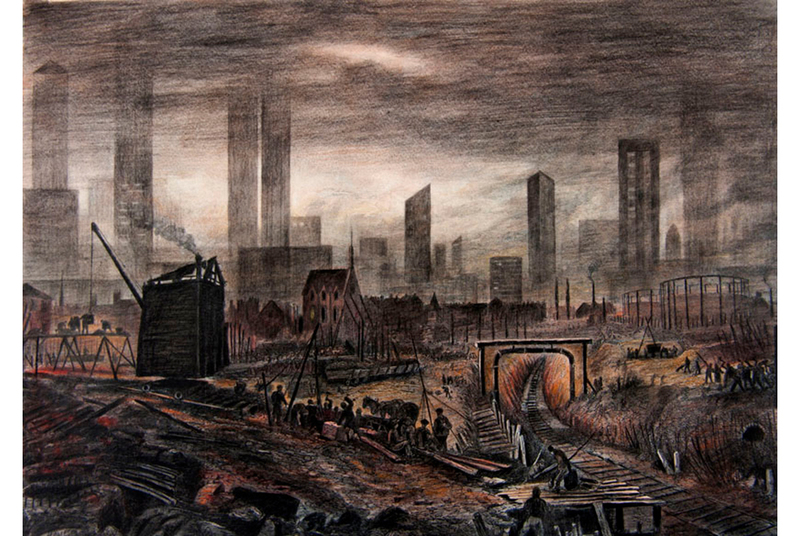 Anne Howeson, Regeneration and Revival at Kings Cross, 2015. SHEFFIELD.- Artwork shortlisted for a prestigious national prize has gone on show in Sheffield in a new exhibition at the Millennium Gallery. The John Ruskin Prize 2017: Master of all Trades brings together work by 26 artists, makers and craftspeople in the running for the award, established by The Big Draw in collaboration with the Guild of St George. The John Ruskin Prize 2017 shortlisted artists are: Louisa Boyd, Holly Brodie, Nuala Clooney, Andrew Ekins, Erin Dickson, Paul Hazelton, Marielle Hehir, Anne Howeson, Rebecca Ilett, Shelley James, Debbie Lawson, Emily Lazerwitz, Sue Lawty, Bethan Lloyd Worthington, Hugh Miller, Rosa Nguyen, Kyle Noble, Briony O Clarke, Sumi Perera, Shauna Richardson, Conor Rogers, Fi Smart, Serena Smith, Harland Viney, Simon Ward & Robert Mach, and Ray Winder. The John Ruskin Prize 2017 invited artists to respond to the theme Hand & Eye: Master of All Trades in The Age of Jack. Investigating the idea of Artist as Polymath, a master or mistress of multiple disciplines, this years Prize has attracted artworks that highlight the parallels of observation and experimentation between artists and scientists. Sumi Pereras 2B or not 2B fuses Shakespeare, sketching and soundwaves to form undulating wave graphs. With her unique form of Participatory Cartography Briony O Clarkes Sea Fax draws on the power of a different kind of wave; closing a gap of hundreds of miles she brings the tide into the gallery itself with an ingenious marbling printing machine. Emily Lazerwitz skillfully and painstakingly utilises traditionally feminine crafts of tapestry and embroidery to comment on the masculine arena of the stock market, creating infographics with statistics whose relevance is lost before the first stitch. Among this years largely sculptural shortlist is a Sheffield artist whose work is gaining increasing attention. Conor Rogers intricate paintings on unlikely objects such as cough medicine bottles, polybags and cigarette packets create an uneasy experience for the viewer; with the modesty of these everyday canvases at odds with the loaded scenes depicted on them. The John Ruskin Prize is now in its fourth year and invited entries from emerging and established artists and makers aged 18 or over living in the United Kingdom. The Award is £5000 with £3000 going to the winner, and £1000 going to both the Second Prize and Student Prize winners. The shortlist exhibition, Master of all Trades, is on display from 21 June  8 October 2017, and provides a contemporary counterpart to The Ruskin Collection, which is cared for by Museums Sheffield and on display at the Millennium Gallery. The members of The John Ruskin Prize 2017 selection panel are: Kirstie Hamilton (Head of Exhibitions & Displays, Museums Sheffield), Zachary Eastwood-Bloom (Sculptor), Mandy Payne (Artist), Julia Bell (Head of Partnerships, BALTIC Centre for Contemporary Art), Dr Rachel Dickinson (Director for Education, Guild of St George / Principal Lecturer, Manchester Metropolitan University), and Kate Mason (Director, The Big Draw). Kate Mason, Director of The Big Draw commented: This year's theme for The John Ruskin Prize, which placed the artist centre stage as modern-day Polymath, seemed to resonate strongly with the current zeitgeist and mood. For the first time it enabled artists whose work was interdisciplinary and more fluid to submit, and resulted in a huge number of high quality applications from which it was a real challenge to shortlist. The shortlisted artists' work not only acts as a mirror to reflect recent political and social change but also presents an exhibition which we hope Ruskin, if alive today would enjoy visiting. The work offers both a contemporary and traditional interpretation of the polymath theme as well as exploring the quirky, playful and beautiful.